Beth Ann & Jessica's Helpful Savings: Sears: Emeril 3 Pack Bamboo Cutting Boards $17.99! 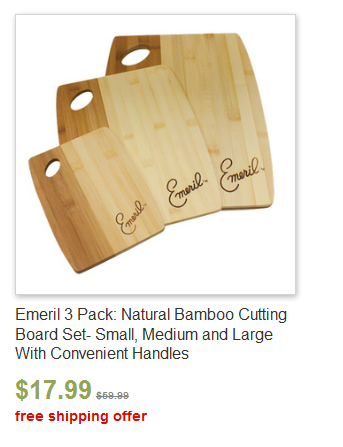 Sears: Emeril 3 Pack Bamboo Cutting Boards $17.99! Sears Deals of the Day: Emeril 3 Pack: Natural Bamboo Cutting Board Set- Small, Medium and Large With Convenient Handles just $17.99, down from $59.99. Check out the other deals too!